Dr. Sumit Khetarpal, MBBS, MD(Internal medicine), is a Senior Consultant - Internal Medicine at Max Superspeciality Hospital, Mohali. Prior to joining Max, he worked as a consultant –Internal Medicine in the Department of Acute Medicine / Emergency Care at Fortis hospital, Mohali and was associated with ECHS, Chandigarh as a Senior Medical Consultant. Dr. Khetrapal is an alumnus of PGIMS, Rohtak from where he attained his undergraduate degree(MBBS) as well as a post graduate degree in Internal Medicine. 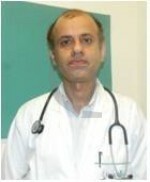 After completing his Residency tenure at GMCH, Sec 32, Chandigarh, he worked as a Registrar in the department of Internal Medicine at the same hospital. To his credits, he published his research work in various peer- reviewed journals nationally and internationally. Moreover, he has participated in many national & international conferences to update his knowledge and skills with the latest technologies & advancements. He is a Clinical Investigator for many drug trials.